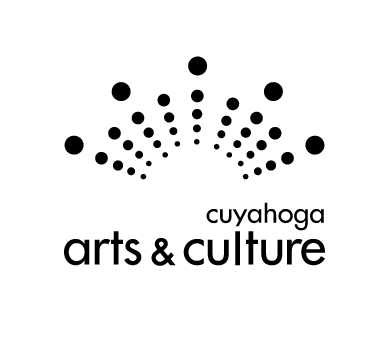 The next installment in the Know Our Heritage series focuses on the connection between Cleveland’s Jewish and African-American communities, as expressed through shared architectural landmarks found in Cleveland’s historic neighborhoods. Nationally the relationship between Jews and Blacks is complex, nuanced and richly textured. Throughout the years, both groups have been able to find similarities in their history and to empathize with the other. When it comes to housing, both African-Americans and Jews have faced discrimination and restriction, and have, consequently, found themselves sharing neighborhoods. The Great Migration of African-Americans and the second wave of Jewish (Eastern European) immigration partially overlapped, resulting in large numbers of these two groups locating in prescribed areas of northern American cities, such as Chicago, Philadelphia and Cleveland. 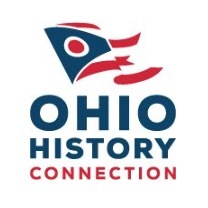 The first Jews arrived in Cleveland from Germany in the 1830s, settling primarily in the Central area and gradually moving eastward towards the suburbs through the end of the nineteenth century and into the middle of the twentieth century. The subsequent wave of Eastern European Jews to move into Cleveland in the 1870s and 1880s entered into the areas already inhabited by the earlier Jewish immigrants. Early in the Twentieth Century, African-Americans also lived in other parts of the east side, but no area was predominantly African-American. As other ethnic groups dispersed and restrictive covenants limited where the rising African-American middle class could buy property, the area around Central Avenue began to become exclusively African-Americans. As Jews and other groups moved to the suburbs after the war, African-Americans began to move to Hough, Mount Pleasant and Glenville. As Cleveland’s Jews followed the national trend of moving from the urban neighborhoods to the suburbs, blacks were able to rent or buy property, including synagogues, in these areas. Several of Cleveland’s synagogues were bought by African-American Christian congregations. The oldest Jewish congregation in Cleveland was a German Orthodox group established in 1841 (chartered in February 1842) that came to be known as Anshe Chesed, now known as Fairmount Temple. This congregation built Cleveland’s first synagogue, near the intersection of Eagle Street and Woodland Avenue. The site of now-demolished Eagle Street Synagogue is roughly center field of Progressive Field. As the Anshe Chesed congregation grew, the Eagle Street Synagogue became too small for their needs. A new, larger building was completed in 1887 at Scovill Avenue and Henry Street. The Scovill Avenue Synagogue, which would now be on the campus of Cuyahoga Community College near what is now called Community College Avenue and E. 25th Street, has been demolished. Photo by Michael Tevesz, Center for Sacred Landmarks Collection. Cleveland State University. Special Collections. Anshe Chesed continued to flourish, and in 1910 began construction on a third synagogue on Euclid Avenue at E. 82nd Street. Designed by architects Lehman and Schmitt, who also designed the Cuyahoga County Courthouse, the Euclid Avenue Temple was dedicated in 1912. The Neoclassical synagogue featured a symmetrical plan with a semicircular auditorium holding seating for 1,400 and stained glass windows designed by Louis Tiffany. As many of Anshe Chesed’s members moved east, the congregation made the decision to move to Beachwood and build a new facility. A building permit was issued for the construction in the eastern suburb in 1954, with the name of the congregation changing to Fairmount Temple. With this move from the city, the Euclid Avenue building was sold to the members of Liberty Hill Baptist Church, which moved into the landmark in 1957. 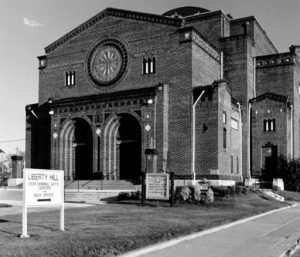 The congregation of Liberty Hill Baptist was formed in 1917 and moved several times before finding a home on Euclid Avenue. Just a few years after Anshe Chesed was chartered in the 1840s, a group of members broke off to form a new congregation, which became Tifereth Israel, the city’s second oldest Jewish congregation. This group built the Huron Road Temple, dedicated in December 1855, at Huron Road and Miami Street (now E. Sixth Street), now demolished. In 1894, as the Jewish community was moving eastward, Tifereth Israel relocated its congregation to a new synagogue they had constructed on the corner of Willson Avenue (now E. 55th Street) and Central Avenue. This building, the Willson Avenue Temple, was designed by Lehman and Schmitt, the same architects of the Euclid Avenue Temple, and completed in 1894. In 1924, the congregation of the Temple moved to University Circle, leaving the Willson Avenue Temple empty. Eventually they would make their home in Beachwood. From 1924 to the late 1930s, the Willson Avenue building was home Mt. Zion Congregational Church. In 1940, the church was purchased by Friendship Baptist Church, one of the city’s largest Baptist congregations. Cleveland’s third-oldest Jewish congregation is B’nai Jeshurun, established in 1866 by Hungarian immigrants. Following worship in several temporary homes, B’nai Jeshurun purchased the Eagle Street Synagogue from Anshe Chesed in 1886. In 1905 B’nai Jeshurun built Temple B’nai Jeshurun at 55th and Scovill. The neoclassical synagogue, dedicated in September 1906, was designed by architect Harry Cone. 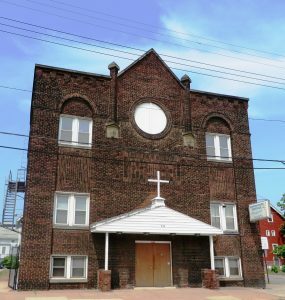 In the early 1920s, B’nai Jeshurun sold the Scovill Avenue building to Shiloh Baptist Church, which is the oldest congregation of African-American Baptists in the city of Cleveland. Despite steady growth of its congregation and support from John D. Rockefeller, Shiloh’s previous attempt to secure a permanent home had not been successful. With the move to the building on Scovill, the Baptist church was able to continue to expand its programs and services to its congregation and the greater community. The church created a quarterly magazine for and about the church; started a credit union; began a food bank; assisted students in finding help for higher education; and created many additional outreach programs for individuals of all ages. 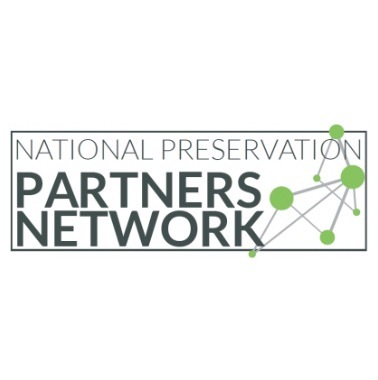 The congregation has been an excellent steward of the building, and in 2006 was given a preservation award by the Cleveland Restoration Society. Shiloh Baptist Church has been designated a Cleveland Landmark. In 1904, a group of congregants decided to split from B’nai Jeshurun, wanting to remain Orthodox. They formed the Oheb Zedek congregation and in 1905 opened the Oheb Zedek Hungarian Orthodox Synagogue, which was designed by Albert S. Janowitz and located at E. 38th Street and Scovill Avenue (now 3782 Community College Avenue), in the Central neighborhood. This congregation moved to a new home in the Glenville neighborhood in 1922, and Triedstone Baptist Church acquired the building at E. 38th Street and Scovill. Over the years, the Triedstone congregation has made changes so that the church can better accommodate its Christian worship. A large baptistery has been added inside the sanctuary, and an enclosed courtyard now connects the historic church building to a newer education building. The church at the intersection of Parkwood Drive and Morison Avenue is where Oheb Zedek moved after it left the Hungarian Orthodox Synagogue in the 1920s. Designed by architect William Markowitz & Harry G. Vetter and completed in 1922, the Parkwood Drive church was sold by Oheb Zedek in 1949 to Integrated Faith Assembly. Anshe Emeth was founded in 1857 by Cleveland’s Polish population. This group met in rented halls until 1880, when it bought the Erie Street Methodist Church on E. Ninth Street. In 1904, Anshe Emeth built a synagogue at Scovill Avenue and E. 37th Street, then and moved to a larger building in Glenville in 1912. Through mergers, it became the largest Orthodox congregation in the city by the mid-1910s. By 1919, Anshe Emeth’s rabbi led a push to create a center for Jews in Cleveland. This was built on land purchased from the Deming Land Company in the Glenville neighborhood, with the building located at 1117 E. 105th Street. The Cleveland Jewish Center, designed by architect Albert S. Janowitz, was dedicated in October 1922. It contained recreational facilities, classrooms, meeting spaces, and a large auditorium. In 1947 the congregation sold the Jewish Center building to the congregation of Cory United Methodist Church. Anshe Emeth moved to a new synagogue in Cleveland Heights (Park Synagogue, designed by architect Eric Mendelsohn, dedicated in 1950). 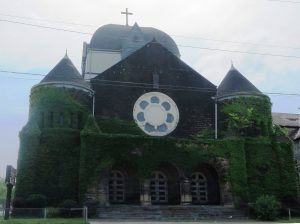 Cory was one of Cleveland’s earliest African-American congregations, having been founded in 1875 and first known as Union chapel. The congregation was renamed to honor a missionary who had reputedly founded multiple Methodist churches in Cleveland. Cory had met on Central Avenue and E. 37th Street beginning in 1890 and then moved to a larger church on Scovill Avenue in 1911. With the continued increase in congregation size, church leaders needed space to accommodate the worshipers, and by the mid-1940s, had raised the money needed to buy the Jewish Center. Knesseth Israel first formed in 1887 purchased the property at 936 East 105th in 1920. The current structure was built in 1922. The congregation merged with Taylor Rd in 1955, however, services continued at this location for several years. The building was acquired by the Apostolic faith Tabernacle in 1959 and continues to hold regular prayer services. Not all of the African-American churches with a connection to the Jewish community are grand sacred landmarks. After splitting off from B’nai Jeshurun in 1887, Knesseth Israel congregation built its synagogue at 934 East 105th Street in 1922. The congregation would eventually join Oheb Zedek and sell the building to Apostolic Faith Church in 1959. The Morison Avenue Communal Baths, at 10606 Morison Avenue, was designed by Meyer Altschuld and built in 1925. Known as a mikvah, this building is now the home of the Morison Avenue Missionary Baptist Church. While the current congregations have made changes to adapt the original Jewish synagogue design for their contemporary Christian worship, with many of these sacred landmarks, evidence of their origins as Jewish places of worship can be found. For example, there is often a Star of David detail incorporated into the facade, or the stained glass windows may still feature Jewish symbols. Through the legacy of a shared space, some of these congregations nurture their relationship and choose to stay connected through periodic gatherings and combined services. Three former synagogues turned Christian churches were recently nominated as Cleveland landmarks as part of Councilman Jeff Johnson’s work to designate historic buildings in the Glenville neighborhood: Chebath Jerusalem/Pentecostal Church of Christ, Oheb Zedek/Integrated Faith Assembly and Knesseth Israel/Apostolic Faith. Chebeth Jerusalem at 887 Parkwood was bought in 1956 by the Pentecostal Church of Christ, which is the oldest Pentecostal congregation in Cleveland, established in 1935. Unfortunately, the building collapsed a short time after being nominated. As this summer marks the 50th anniversary of Freedom Summer, a key period of Jewish/African-American partnership, and a time when this collaboration was most fruitful in accomplishing one its main goals – the end of discrimination in housing, education and employment, this examination of the relationship between Cleveland’s Jews and Blacks is indeed timely. Nationally there are many examples of an African-American/Jewish effort to address pressing civil rights issues. Several organizations dedicated to the strengthening of the African-American community with programs for employment or housing rights included Jewish individuals on their boards, such as Henry Moskowitz of the NAACP, Edwin R.A. Seligman of the National Urban League, and Will Maslow of the Core of Racial Equality (CORE). 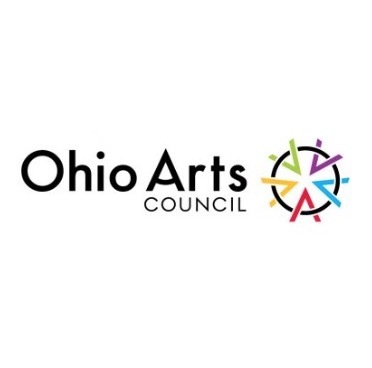 Locally, the Cleveland NAACP and the Jewish Community Council were instrumental in the establishment of the City of Cleveland’s Community Relations Board, which informed the Civil Rights Commission to work on the passage of the Fair Employment Practices Act, the Fair Accommodations Act and the Fair Housing Statute. Reuben Silver served as artistic director of Karamu House for decades and Rabbi Arthur J. Lelyveld of Fairmount Temple worked with the desegregation goals of the Freedom School movement. During Freedom Summer in 1964, he helped with voter registration efforts in Hattiesburg, Mississippi where he was physically attacked by segregationists. This survey is a powerful reminder of the long ties and the important historical space that is shared between the two communities.